While Gothic had started to replace Romanesque in the north of France since the middle of the 12th century, it took almost another century before the style reached the area that is nowadays known as the Netherlands, which then was still divided in numerous duchies, counties and enclaves, some of which included parts of the current Germany and Belgium as well. Here, it marked both profane and religious medieval architecture, but most of the style's surviving buildings are churches. The former cathedral in Utrecht is one of the first Gothic churches in the Netherlands, construction of it having started in 1254. One other church competes with this cathedral for the title of oldest Gothic church in the Netherlands; the St. Bavo in Aardenhout dates from 1250 according to some sources, but others date it a whole century later. Utrecht's cathedral however is the only church in the Netherlands that can be considered to be in the original, French Gothic style, although it only has one tower, which itself was often copied for other churches. This tower was built in the same period as the rest of the church, which is rather unusual. 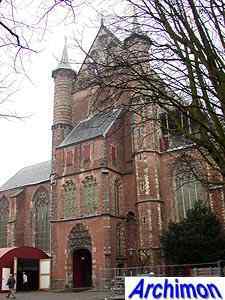 All other Gothic churches in the Netherlands belong to one of several regional variants, the more important of which are explained later on this page. Smaller churches are often in such a simplified style that it's hard to categorize them, although again there are often regional similarities. Of the regional variants the Brabant one is the most important, having been of influence on most other variants as well. There are however no strict dividing lines between most of the styles. Considering the long periods it took to finish a big church, several different styles may have been applied to one single building. The same goes for the architects, several of whom may have been involved in a single project. Incidentally, Gothic is the first style of which architects are known by name. An important architect was Everaert Spoorwater from Antwerpen, who was involved in the construction of many Gothic churches throughout the country, although he often only spent a few days in a row at one site before moving on to the next one, leaving much of the designing to the responsibility of the local craftsmen. Other important architects were the members of the Keldermans family. Gothic lost in importance in the second half of the 16th century. By that time the style had already been much simplified. The enormous cost, size and ornamentation of some of the Gothic churches were some of the reasons for the rise of protestantism. After the Reformation other styles became more important. Catholic churches were confiscated by protestants, often unfinished. Gothic did however continue to be an influence for many of the first protestant churches in traditional style. Some completely new churches in late-Gothic style were built until well into the 17th century. The following is an effort to sum up all major regional styles, and explain them. All of these variants are mentioned in many books, but strangely many of these books often leave out one or two of them. Also, all variants here are called by their usual Dutch name, by lack of proper English terms. An attempt at a translation in English is put between brackets after each Dutch name. One of the oldest local variants (the oldest if those sources that claim that construction of the St. Bavo in Aardenburg didn't start before 1350) in what is now the Netherlands is found in the Maasdal (valley of the river Maas/Meuse), roughly the southern part of the current province of Limburg. A local style developed here from the early 13th century onwards, starting in Maastricht, and still had many Romanesque characteristics, like relatively small windows. Other typical features of this style are the use of marl stone, fake tribunes and the so-called Maaskapiteel (Maascapital), a piece of sculpture that formed the top of a column and was richly decorated with stylised leaves. The upper parts of gables, from the front or from the transept-arms, are often decorated with niches with tracery. The first example of this style is the Dominicans' church (picture left, built c. 1261-1280). 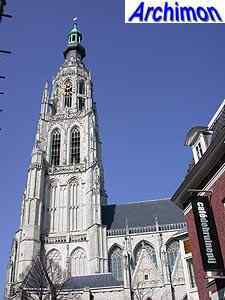 In the same city, the Onze-Lieve-Vrouwekerk and the St. Servatius have Gothic elements in the Mosan-style. The style reaches a height with the St. Bartholomeus in Meerssen. Most examples of this style are found in Limburg, although the St. Petrus in Leende (NB) is closely related to this style, as is the Dominicans church in Zutphen (G) This church is a close copy of the two monastic churches in Maastricht, except for one aspect; it's made of brick instead of marl. About as old as the Mosan style is Schelde-Gothic. The southern part of the current province of Zeeland historically belonged to the Duchy of Flanders. From the 13th century, in several cities churches in Flemish Gothic style were built, of which the St. Bavo in Aardenburg (left, started either c. 1250 or 1350) is the most complete survivor. 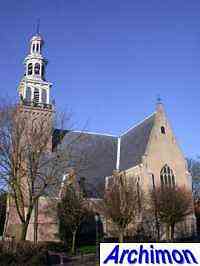 Another example is the church of Cadzand, part of which is in this style. Flemish influences however were not limited to its own territory, and can be found in much of the rest of Zeeland and in Zuid-Holland as well. The abbey church of Loosduinen, now part of Den Haag, shows Flemish influences in both the tower and the nave. Octagonal towers and tower-segments in these areas are often related to Flemish architecture too, as in the case of the reformed church in Kruiningen. This variant is mostly found in the delta in the southern part of the province of Gelderland, in the province of Overijssel and in the northern part of the province of Limburg. This style is strongly influenced by the Gothic style of the German Rhineland and began with the church of St. Victor in the German city Xanten. An important feature are the towers, which are often so richly decorated that the silhouet becomes 'soft'. A common feature at the front of the tower is a portal within a tall pointed arch, which in the case of the richer churches holds a large window or, at simpler towers, is mostly a large pointed niche, often a deeply recessed one. Common are also the 'constricted' roofs of transepts and chapels. The most important churches of this style also feature lots of finely crafted ornaments like balustrades and pinacles, which contrast greatly with the brick that is mostly used for the actual building. Churches are found in many types; some are hall-churches, with three aisles of equal height and width, others are pseudo-basilican churches, like the St. Maarten in Tiel. 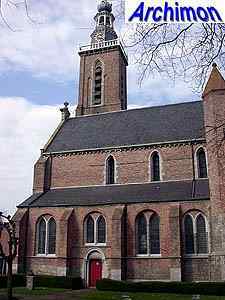 The St. Eusebius in Arnhem is an example of a cruciform basilican church in this style. These two very much related styles includes towers only. Sometimes the two are regarded as one single style, as both cases concern towers inspired by that of Utrecht's cathedral, although they were usually built over a century later and, unlike their example, have buttresses. The most obvious distinguishing feature of these towers is the use of tall but narrow pointed niches, both open and blind, usually three at each side of every square stage of the tower. Others make a distinction. According to them, the Utrecht style includes those towers with an octagonal upper segment, while the Sticht style includes towers with all square segments. 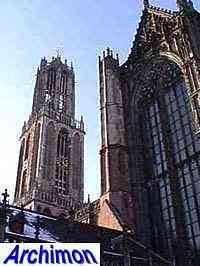 Given the obvious similarities between the towers of these two 'styles' this distinction seems a bit artificial, especially because of the geographical relation; ''t Sticht' was another name for the Utrecht archdiocese, and towers in this style are mostly found in the current province of Utrecht itself, although there are a few examples outside this province as well. The O.L. Vrouwetoren in Amersfoort (left) is regarded as one of the most important examples of this style, representing the type with the octagonal upper segment. Another example is the tower in Rhenen. The type with the square upper part is found, among other places, in Amerongen, Eemnes and Houten. The Duchy of Brabant for most of the Middle Ages was the richest part of the Low Countries. In this region, much of which today is in Belgium, a style developed of a richness that could compete with the French examples. Several large churches were built, with an extensive use of natural stone. Churches are usually high, side aisles often have a gable on each trave, inside of which is often a chapel,and choirs with ambulatories are standard practise. The first example of this style was built in Mechelen, Belgium. Churches in other Belgian cities like Antwerpen en Brussel are perhaps the best examples of this style. 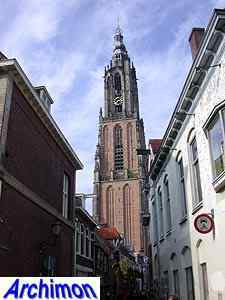 In the Netherlands, the Onze Lieve Vrouwekerk in Breda is the only church in this style that was completed. The St. Jan's cathedral in 's-Hertogenbosch is another important example, but remained unfinished. Some features of Brabant-style churches are the round pillars, usually crowned with capitals that are decorated with sculpted cabbageleaves. There are usually two buttresses on each corner of the towers, one on each side. Brabantine Gothic was of great influence outside the Duchy as well, especially in the County of Holland and Zeeland. 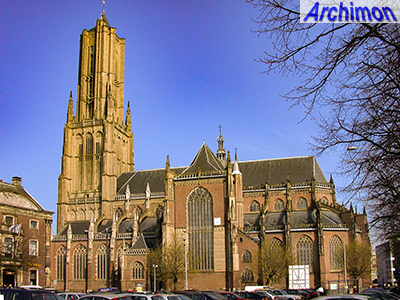 The Great Church of Dordrecht is one of several examples in Holland, and is the closest to the original style. Ultimately several regional variants of Brabantine Gothic developed in the county of Holland. Another important variant developed in Brabant itself, in the Kempen (Campine) area. The Kempen or Campine is an area in Brabant were a distinct variant of the Brabantine Gothic style was developed. This was one of the poorer parts of the duchy, but in the mid-15th century a flourishing cloth-manufacturing allowed for some big village-churches and towers to be built in a style that reached its height in the 16th century. Churches in the Campine-Gothic style are mostly built of brick. Only the towers are often decorated with layers of natural stone. Usually they have a polygonal stair-turret near the south-eastern corner. The richest decorated towers have blind niches that get deeper with every higher segment. The buttresses are heavy and are usually finely decorated as well. The churches themselves are in most cases pseudo-basilicas. Apart from many smaller examples, several large churches were built in this style, most notably those in Oirschot (left) and Hilvarenbeek. 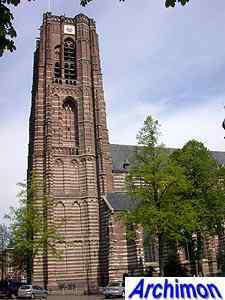 Of other churches in this style the tower is the only surviving part, like the examples in Alphen, Vught and Sint-Michielsgestel. A variant of Brabantine Gothic is found along the coast in the former county of Holland. Here the moist soil was too weak to support the enormous weight of the kind of churches that were build in Brabant. A solution was found in a number of measures. Instead of stone vaults, wooden barrel vaults were used. Churches were also often not so high as usual, but longer and/or wider. 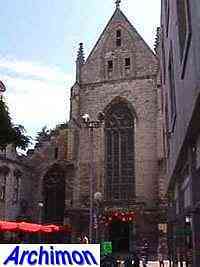 The St. Jan in Gouda is an example of an extremely long church. With its nave of 123 meters this is the longest church in The country. 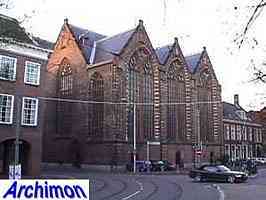 The St. Pieter in Leiden (picture left) is an example of a very wide church. Churches in this style usually are made out of brick, although there are exceptions in natural stone, like the St. Bavo in Haarlem. This style became popular around the year 1550 especially for the enlargement of existing churches. This type is characterized by the side-aisles, which are as high as the nave. All traves have gables and seperate wooden barrel vaults square on the longitudal axis. This method was first used for the enlargement of the St. Jacob's church in The Hague, hence the name of the style, and made it possible to use very large windows without weakening the church's construction. One of a very few other churches were this principle was used for the entire construction of the church, and probably the most important example of the type, is found in Aalsmeer. Examples of churches that were enlarged using this system are the Kloosterkerk, also in The Hague (left), the aforementioned St. Jan in Gouda, the Old Church in Amsterdam and the reformed church in Voorburg. Besides the styles mentioned above that in most cases apply to bigger churches, Gothic had a big influence on the design of village churches and chapels. Here again several regional styles appear to have existed, all drastic simplifications of classic Gothic, although a church could have a tower in a richer style. Little is known about these nameless regional styles of village churches. One distinct style is found in the current province of Zuid-Holland. Churches in this style have a three-aisled nave with a tall roof covering all of the aisles, with each or every second trave of the side-aisles having a gable with a saddle-roof square on the main axis of the church. The transept is usually relatively narrow. The church of Haastrecht, although rebuilt after almost complete destruction omitting the choir, is representative of this regional style. Other examples can be found in Rijswijk and Poortugaal.